A little more overt? This will help Members of Parliament understand what our asks are. Direct communication is key. This is one of many actions that will give rise to conversations that will lead to our collective success. Your MP needs to hear from you and other constituents. Ask your local health food store or supplement dispensary if (and when) they are going to participate in distributing these postcards to their customers. Let NHPPA know and we’ll make sure they are outfitted with a stack or ten! –The QR Code will advance your MP to a DO YOU WANT MY VOTE? page on NHPPA’s website. They can read relevant information about the potential end of the natural health industry if we don’t stop Health Canada’s plans. 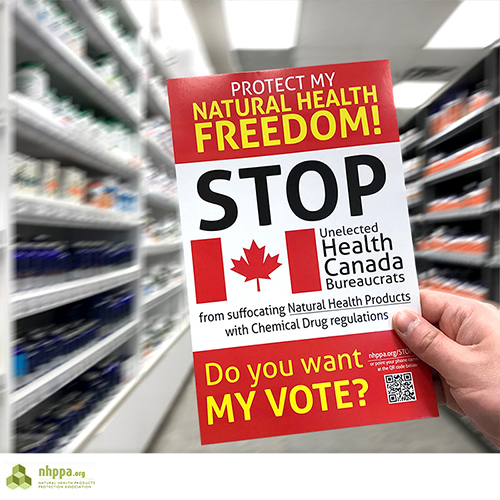 –Lists names and phone numbers of the four Health Canada employees responsible for the changes that now threaten natural health product and practices.